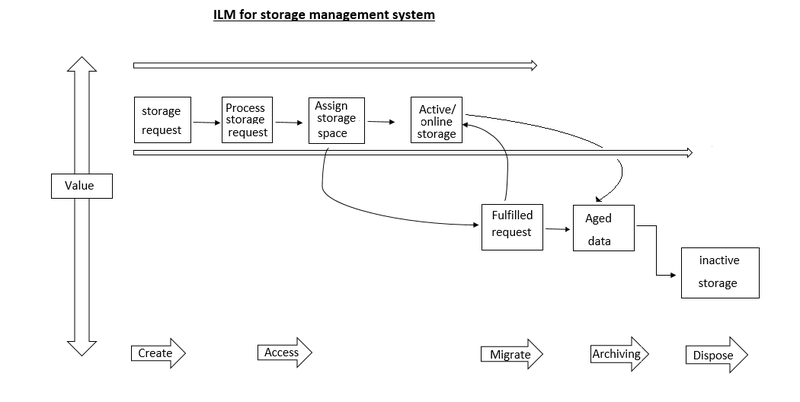 Question: Design and implement ILM for Storage Management System. The critical requirements of the business enterprises for data is its availability and security. The data centres fulfil these business requirements by proper and efficient use of the storage infrastructure. Alongside, there should be a strong information management policy to support infrastructure to the best possible benefits. Based on predefined business policies, information management (ILM) is a proactive strategy facilitating the IT organisations to manage the data efficiently throughout its lifetime. This facilitates the IT organisation to avail maximum return on investment (ROI) of the storage infrastructure. ILM has five phases as given below. In storage management system, the value of information changes from the time the request is placed until the time that request is fulfilled as shown in figure below. The value of the information is highest when a new storage request is received and processes it to assign storage space. After the request is fulfilled, the requested data need not be available for real time access. The storage management system can transfer this data to less expensive secondary storage until the data is less active or offline. After the storage becomes inachve, the system can archive or dispose of data to create space for other high-value information.